Typically I can find the words to describe how I feel regarding a film as the credits are still rolling on the screen. 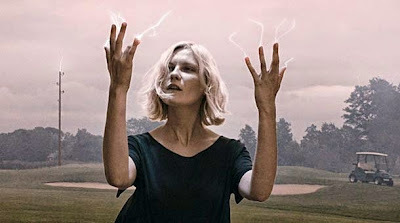 My mind builds up various thoughts throughout and I cannot wait to unleash them as soon as possible, but I had to sleep on Melancholia before typing up this review. In fact, I'm still not quite sure if I am ready. A graceful and fascinating look at a subject like depression, I found moments within the film that were utterly spellbinding, and in those moments I was sure I was in love with this work by von Trier. However, every so often I was forced to question whether the nature of the storytelling and the pacing of the film had crossed over the thin line between authentic and ponderous. Did so much screen time need to be devoted to the first half of the film involving the wedding? I am not so sure if the answer is yes. I didn't mind watching a solid performance by Kirsten Dunst captivate how all consuming and powerful depression can be, even during moments that are supposed to be the happiest. Still, the devastation of such would not have been lost, and in fact the message may have been more effective in its delivery had a few minutes here and there been left on the cutting room floor. 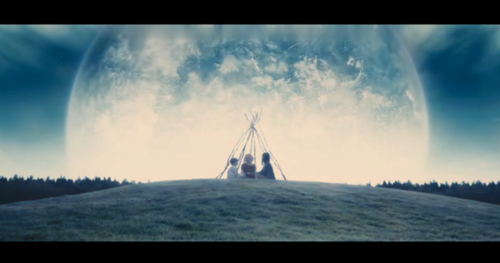 What I did appreciate about Melancholia was the fact that Lars von Trier kept the story limited to the world we see in front of us, dedicated only to these characters in this location as a mysterious new planet moves closer and closer to a collision with Earth. Typically with end of the world scenario films, we would be inundated with footage from television networks covering the story, analyzing the potential for destruction, providing us updates and so on. None of this is found here, as the only focus on what approaches comes from the mouths and mannerisms of these two troubled sisters and those that surround them. The imagery and score of the film were at times breathtaking, and I found the final sequence to be brilliantly profound, specifically the fact that the only three people present are the two sisters struggling with their illnesses and the child. It is easy for others to abandon someone with depression, but a child can so easily become the victim of being raised under such conditions, feeling the devastation of it all just as much if not more so than the actual afflicted party themselves. I feel like there is a masterpiece in here somewhere, and perhaps I can extract it out in the future. For now, I am left thinking von Trier has crafted a very good and interesting film that, with a few minor tweaks, could have been something truly special. I don't quite understand the hideous pieces of film making notion, but to each their own. I thought this was just short of being absolutely masterful, but the first half just felt like it could have been cut down a bit to make it flow better. Glad you loved it, that's great to hear.